The Alpha Proton X-Ray Spectrometer on the rover measured the compositions of nine rocks. 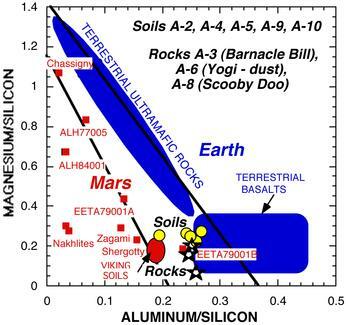 The silicon content of some of the rocks is much higher than that of the martian meteorites, our only other samples of Mars. The martian meteorites are all mafic and ultramafic igneous rocks, volcanic and intrusive rocks that are relatively low in silicon and high in iron and magnesium. Such rocks would be expected to form by partial melting of the upper mantle of Mars. The melt rises up though the crust and solidifies at or near the surface. The mafic volcanic martian meteorites, referred to as basalts, are the most common rock on Earth and have also been found on the Moon. Based on the composition of the martian meteorites and the presence of plains and mountains that look like features produced by basaltic volcanism on Earth, geologists expected to find primarily basalts on Mars. The rocks analyzed by Pathfinder, however, are not basalts. If they are volcanic  as suggested by their pitted surface texture, presumably formed when gases trapped during cooling left small holes in the rock  their silicon content classifies them as andesites. One way that andesites can form is when a basaltic melt from the mantle intrudes deep within the crust. Crystals rich in iron and magnesium form and are separated from the melt, leaving a more silicon-rich melt that erupts onto the surface. The andesites were a great surprise, but because we do not know where these rocks came from on the martian surface, we do not know the full implications of this discovery. If the andesites are representative of the highlands, they suggest that ancient crust on Mars is similar in composition to continental crust on Earth. This similiarity would be difficult to reconcile with the very different geologic histories of the two planets. Alternatively, the rocks could represent a minor fraction of high-silicon rocks on a predominately basaltic plain. for the bumpy textures is weathered lithic fragments and crystals in volcanic rocks. 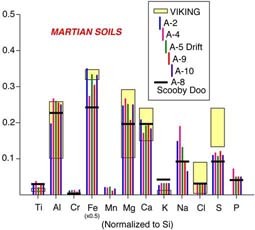 Note: The compositions plotted in the following 5 figures have been superseded by the results presented in: Rieder, R., et al., 1997, The chemical composition of the Martian soil and rocks returned by the mobile Alpha Proton X-ray Spectrometer: Preliminary results from the X-ray mode, Science, 278: 1771-1774. In this diagram, preliminary Pathfinder APXS analyses of soils (yellow dots) extend the range of Viking soil analyses. The analysis of Yogi appears to be contaminated by dust adhering to the rock's surface. 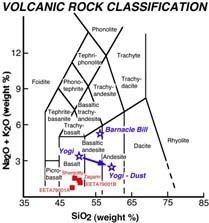 The rock composition can be estimated by subtracting a portion of dust; the resulting Yogi composition is very similar to that of Barnacle Bill (we assumed 50% dust having the composition of drift analysis A-5 and used a linear mixing model to subtract the dust which is only strictly valid if the dust, where present, is thicker than the APXS penetration depth). Barnacle Bill is also contaminated by dust, but to a lesser extent. 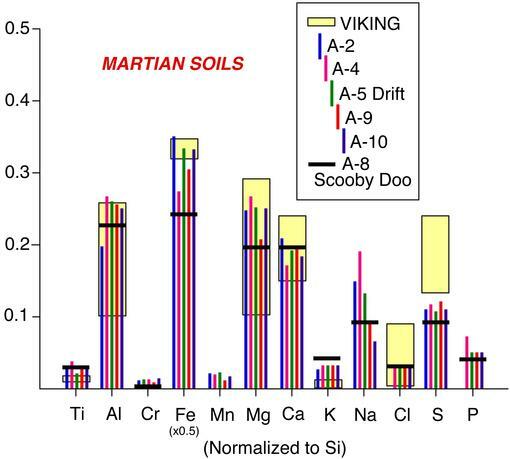 APXS analyses of Martian soils are compared with Viking soil analyses. Each element is normalized to silicon in this diagram. The yellow boxes representing Viking data include all analyses and their analytical uncertainties reported by B.C. Clark and others (1982) Journal of Geophysical Research, vol. 87, p. 10,064. Although the first APXS soil analysis (A-2) was reported to be almost identical to Viking soils, ssubsequent analyses demonstrate some variability and a few significant differences from Viking analyses. Specifically, soils at the Pathfinder site generally have higher aluminum and magnesium, and lower iron, chlorine, and sulfur. Scooby Doo, which appears to be a sedimentary rock composed primarily of compacted soil, also exhibits a few chemical differences form the surrounding soils. Analysis A-5 represents a deposit of windblown dust (called drift), whereas the other soil analyses may be cemented materials. 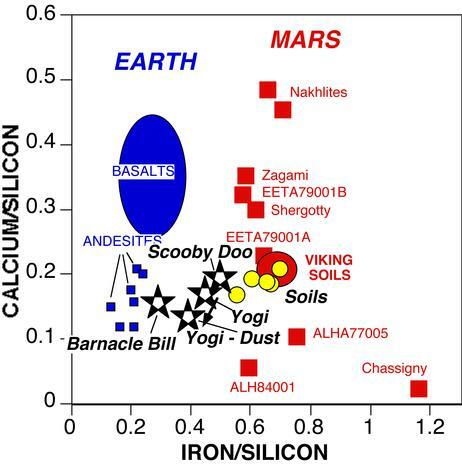 This diagram (preliminary X-ray data) illustrates chemical differences between terrestrial rocks and meteorites inferred to have been derived from Mars. The Martian meteorites (as well as Viking soil analyses) all plot to the left of the fields for Earth rocks. Pathfinder APXS analyses of rocks (stars) and soils (yellow dots) appear to plot in the gap between these previously defined fields, although they are similar to at least one basaltic meteorite. The other two stars represent the compositions of Barnacle Bill and Yogi. The analysis of Yogi appears to be contaminated by dust adhering to the rock's surface. 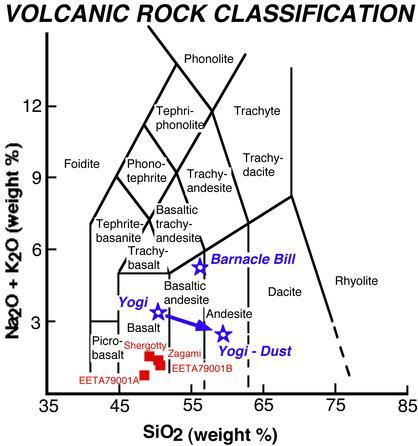 The rock composition can be estimated by subtracting a portion of dust; the resulting Yogi composition is very similar to that of Barnacle Bill (we have assumed 50% dust having the composition of drift analysis A-5 and used a linear mixing model to subtract the dust which is only strictly valid if the dust, where present, is thicker than the APXS penetration depth). Barnacle Bill is also contaminated by dust, but to a lesser extent. 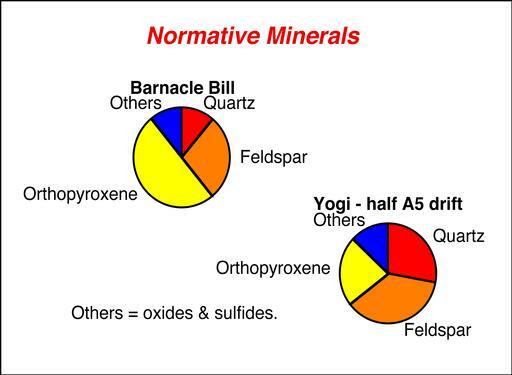 The Pathfinder APXS chemical analyses of Barnacle Bill and Yogi (corrected for adhering dust) have been recast into plausible minerals using the CIPW norm calculation. If they are fully crystalline igneous rocks, both possibly consist of orthopyroxene (magnesium-iron silicate), feldspars (aluminum silicates of potassium, sodium, and calcium), quartz (silicon dioxide), and other minerals that include magnetite, ilmenite, iron sulfide, and calcium phosphate. This commonly used chemical classification for lavas shows that Barnacle Bill and Yogi (corrected for adhering dust) are distinct from basaltic Martian meteorites (shown as red squares). The Pathfinder APXS analyses have been corrected for the presence of a small amount of salt, and sulfur is assumed to be present as sulfide. These rocks plot in or near the field of andesites, a type of lava common at continental margins on the Earth. The preliminary data for alkalis are likely to represent upper limits, so refinement of these analyses could shift them to slightly lower Na2O + K2O and higher SiO2. We do not presently know whether these are igneous (crystallized from a melt), sedimentary (grains/fragments deposited by wind or water or precipitates), or metamorphic rocks (deformed). The preliminary APXS results on Barnacle Bill, Yogi and soil! Hypothesis: APXS data show composition of rock is consistent with volcanic andesite, but rough texture of surface suggests it may be a "breccia." Could it be composed of many different rock fragments that combine to give a similar overall composition? Implication: At spatial resolution of 1-2 cm, rock composition is homogeneous. However, rock may be composed of fine-grained materials (< 1-2 cm) that cannot be seen with this method. 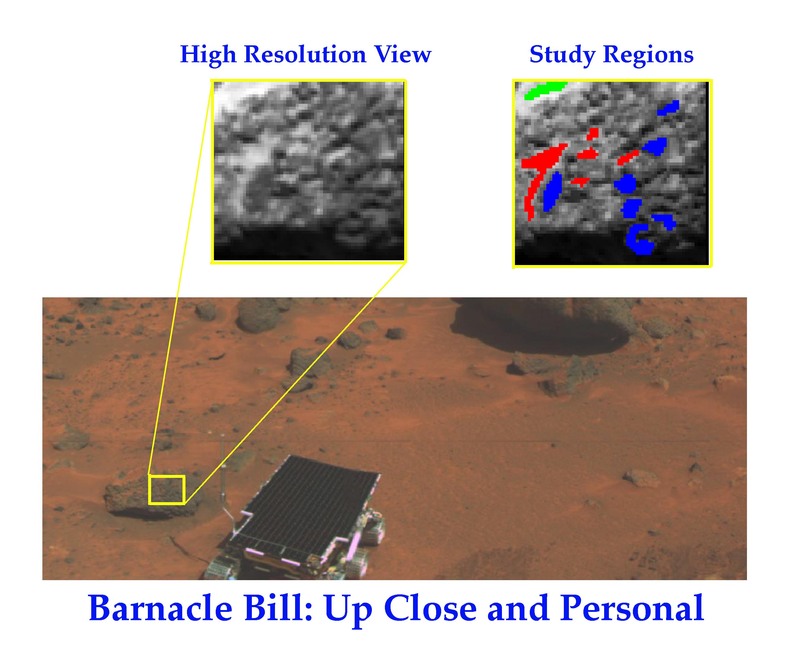 This image shows the location of Barnacle Bill rock (left of the Sojourner rover) and the approximate location of the full-resolution "multispectral spot" acquired on Barnacle Bill. Lossless (no compression) images were taken in all geology filters using the IMP camera to study in detail the variation of brightness in each filter, which provides information regarding the mineralogy of the material sampled. Spectra were extracted from several study regions (shown to the right of the high resolution view). The green area represents soil found behind the rock. Red patches represent brighter areas on the rock that are interpreted as accumulations of wind-blown dust found in small holes, or vesicles, on the rock. Blue patches represent darker rock faces not contaminated by a soil deposit. The spectra of these materials are shown in the accompanying figure. 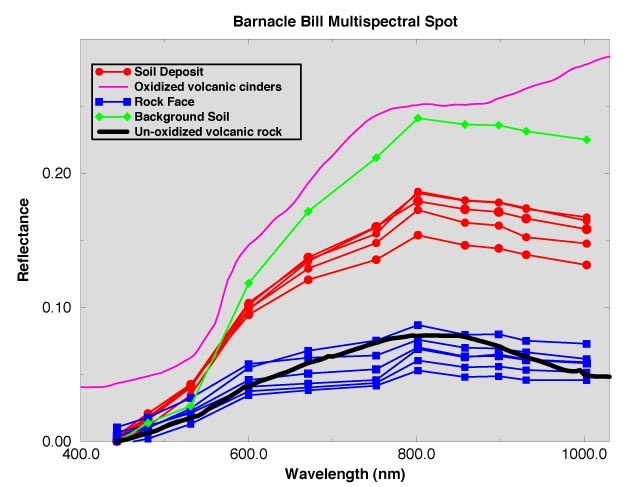 Preliminary data acquired from the "multispectral spot" image sequence for Barnacle Bill rock. Images were acquired with no compression in all geology filters. 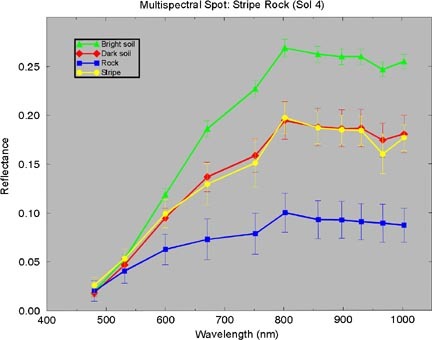 Reflectance spectra (that is, the variation of brightness with wavelength, or color) are shown for background soil (green), soil-like deposits found on and within small holes in the rock (red), and dark portions of the rock face (blue). Comparison of the spectra of these three types of materials demonstrates that the rock has relatively homogeneous composition at the spatial resolution of the patches sampled (about 1-3 cm). That is, all soil-like deposit and rock face spectra cluster in both their overall brightness (reflectance) and shape of their reflectance curves. A more heterogeneous rock would show variable spectral characteristics across its face. Note that the spectra of the soil-like deposit is intermediate to that of the background soil and rock face spectra. This is consistent with the interpretation that the soil-like deposit is a relatively thin layer in which portions of the rock are also sampled within the patches selected. Also shown are laboratory spectra of oxidized and unoxidized volcanic rocks from Earth. Scientists will compare spectra of terrestrial materials such as these to help determine the composition of the rocks observed at the landing site in combination with data returned by other instruments such as the APXS. In the foreground of each image is "Flat Top". Each frame was taken by the IMP camera using a different color filter. The color filters alter the appearance of the image. The red filter has enhanced both the textures of the rocks and the dust on the surface of "Flat Top". The Sojourner rover has successfully navigated the rear deployment ramp. 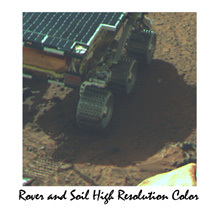 This high resolution color image shows the front, left portion of the rover. The micron scale soil beneath the rover was the first specimen examined by the Alpha Proton X-Ray Spectrometer. This image shows the Sojourner rover in its traveling configuration. The rover has since stood up and driven onto the surface of Mars. 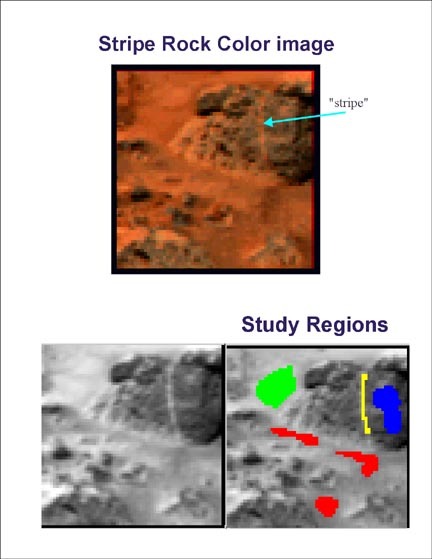 The red rectangle represents the location of the spectral analysis performed by the Imager for Mars Pathfinder. 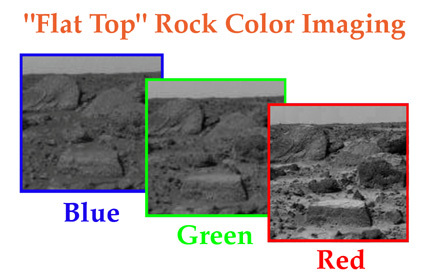 One of the first "multispectral spots" obtained by the IMP camera was of the Stripe Rock on Sol 4. A multispectral spot measurement obtains small images of a region of interest in all geology filters with no image compression. Stripe rock is of interest to Mars Pathfinder scientists because of a bright vertical stripe that appears on the center of the rock face. It was thought that this stripe might be an intruded vein of material of different composition than the surrounding rock. The color image of this rock shows that the stripe is of similar color to the surrounding soils (see arrow). A detailed examination of the rock was conducted to extract preliminary reflectance spectra (that is, the variation of brightness with color) from nearby bright and dark soils, the stripe, and the surrounding rock. Although these data require further calibration (e.g., the lower reflectance at 965 nm is not reliable at this time), they do show that the general spectral characteristic of the stripe is quite similar to the nearby dark soil. This suggests that the "stripe" is actually an accumulation of soil deposited in a crack in the rock face.